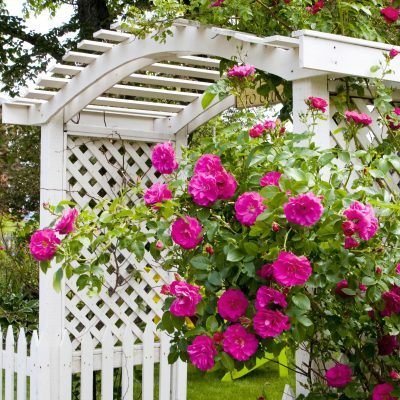 We Offer Fencing To Match Any Style, Purpose, Or Budget. 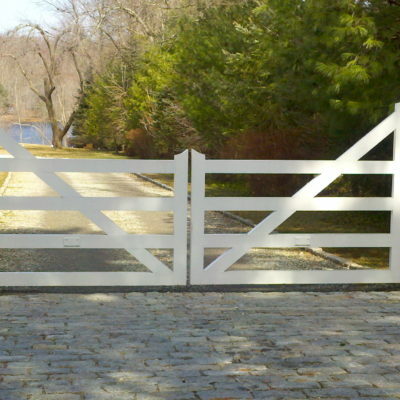 We Can Provide Any Type Of Gate, For Any Purpose. 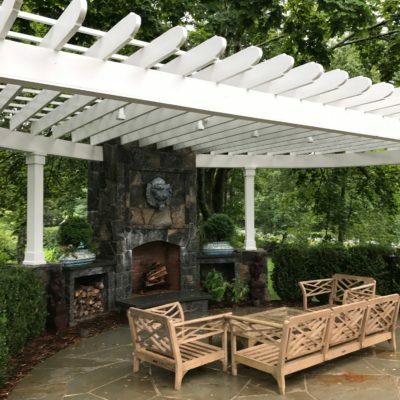 A Beautiful Pergola Is A Great Choice. Red Fox Fence. A Different Kind Of Fence Company. 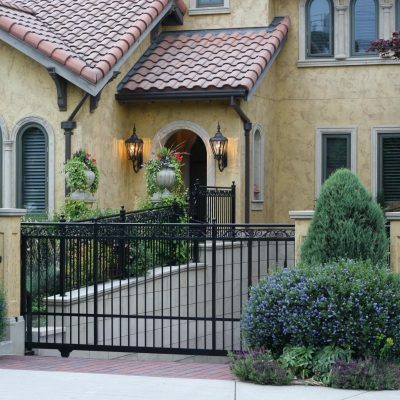 Since 2006, Red Fox Fence has established themselves as a leading fence company in the Tri-State region. 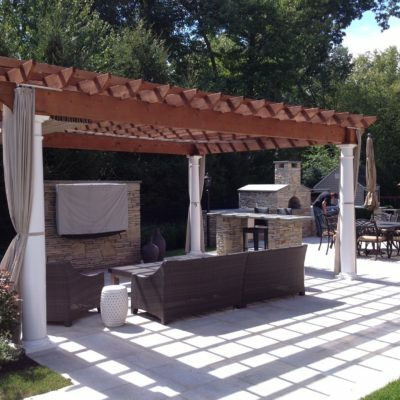 Our reputation has been built on very high-quality craftsmanship, and only using the best materials on each job. Red Fox Fence builds both residential, & commercial fences, and can create any style or design, and do so within a very reasonable budget. 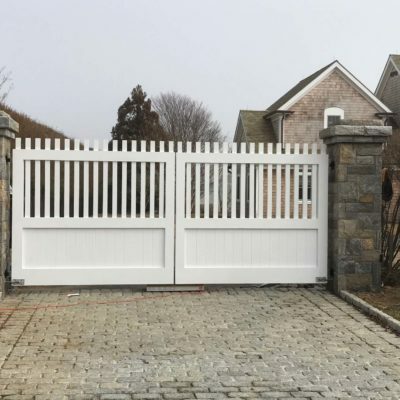 Our talented, and experienced fence installation crews have experience installing all types of fences & gates, in all areas & terrains. 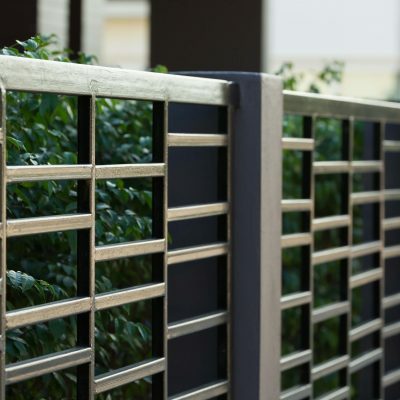 We focus on very high quality installations of only the best fence materials available, to insure that every job, including yours, is done correctly. When choosing your fence company, make sure that they are a fence company that will pride in the way they treat every customer, big or small. This is the cornerstone of our business here at Red Fox Fence! 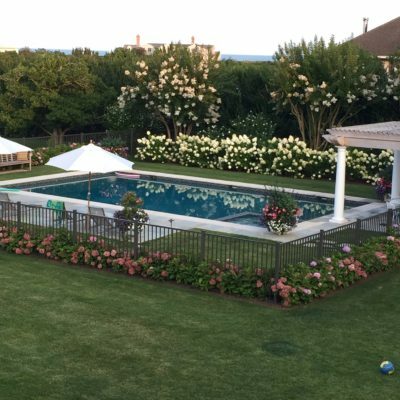 Additionally, because we believe that our reputation means everything, we make sure that you are satisfied with our work on your property before we leave. This is why Red Fox Fence has built our business on referrals from our existing customers. Red Fox Fence is a different kind of fence company. Can we add you to our list of satisfied customers? 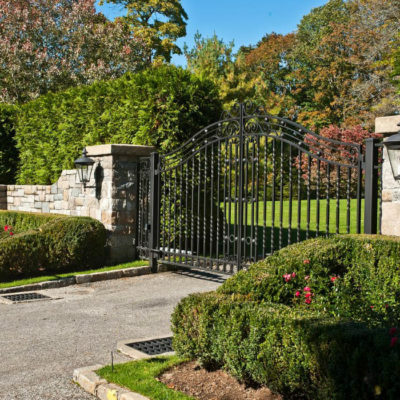 One of the items that we specialize in that has become more & more common is our custom access control and security systems available with our fences. Maybe you just need a simple entry gate? Perhaps you need a more secure gate for a commercial or industrial application. We do them all. We are able to deliver on our commitment for any specifications that you need. 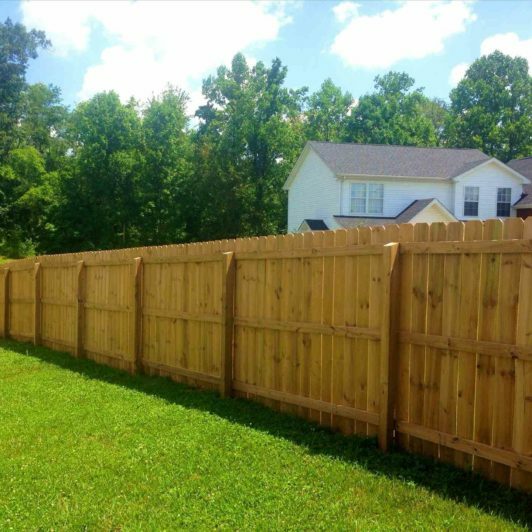 Large or small, you can count on Red Fox Fence to design, & install any type of fencing that you need, no matter how large. 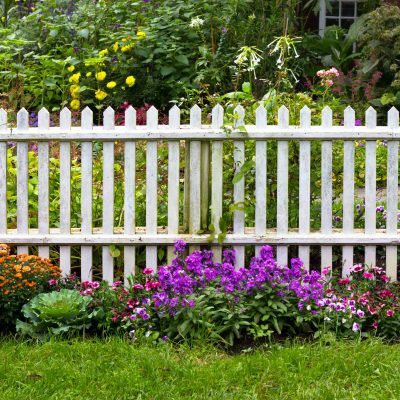 Sometimes, your typical fence company focuses on just a couple different varieties of fencing. This is one reason why Red Fox is not your average fence company. 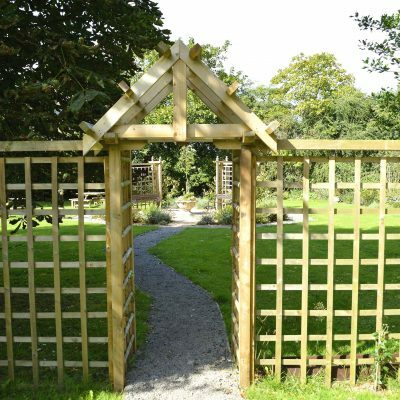 We can provide you with every type of fencing solution for your residential fence. 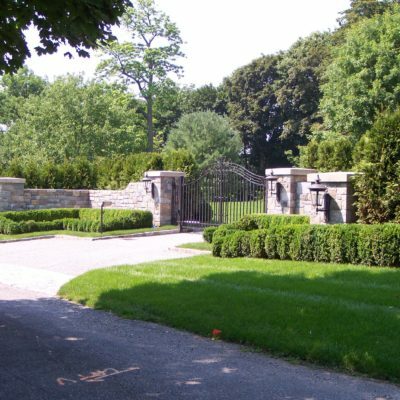 From replacing privacy fencing that is in your backyard, or perhaps you have decided that you want to secure your front yard with a nice driveway entry gate and security automation, Red Fox Fence has the experience, experienced staff, & expertise not only show you a great design that fits elegantly with your landscape, but also the ability to install your new fence to a standard that will surely exceed your expectations. 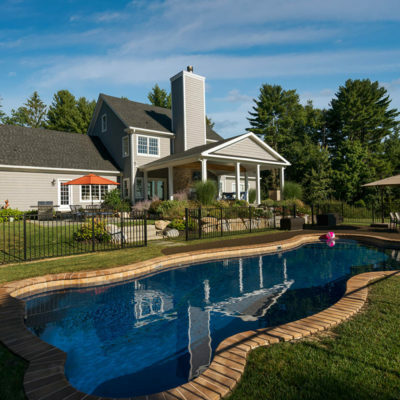 We believe that once you work with us, you will see that when choosing us, you will rest assured that you chose the right fence company for your needs. 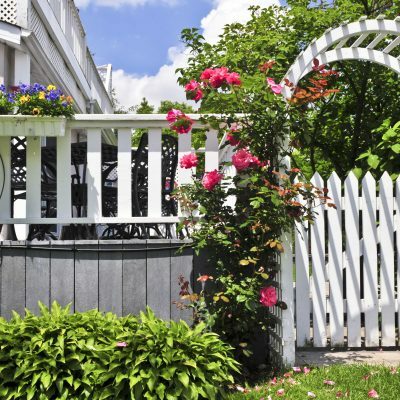 Perhaps you are not certain whether you want a wood fence, aluminum fence, or perhaps a beautiful ornamental iron fence? Our design team can help you choose which is the right choice for your property and your need. Talk to a representative from Red Fox Fence. 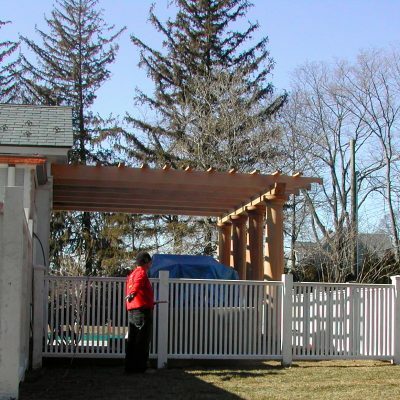 Once you do, we are confident that you will understand that we are a different kind of fence company. We listen to what you want, & what you need. We then offer you solutions that are focused on affordability, all the way up to a masterpiece that belongs in a magazine. Your wish is our challenge. And we haven’t lost a challenge yet! 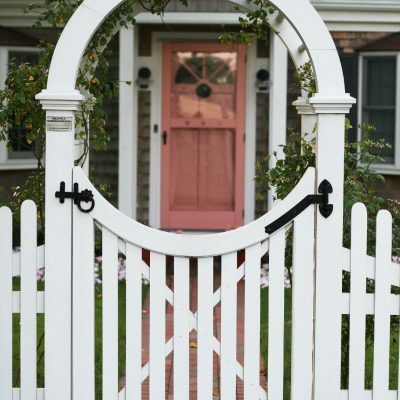 When it comes to building a new fence, or gate for your property, everyone is unique. 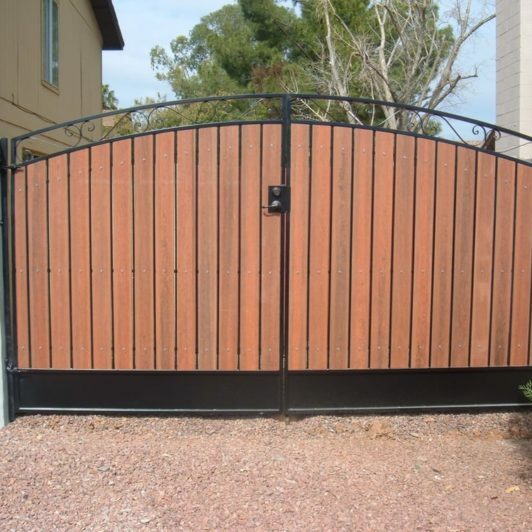 Maybe you are looking for a new gate that leads to your pool, yard, sidewalk, or your driveway. A well designed fence or gate, can really add to not just the functionality, but also the beauty and aesthetics of your property. 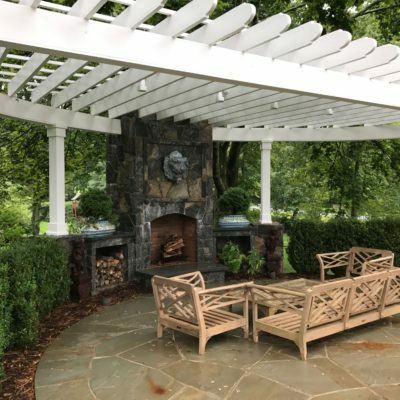 One of the things that makes Red Fox Fence different from any other fence company in the Tri-State area, is that we love the challenge of a beautiful design. 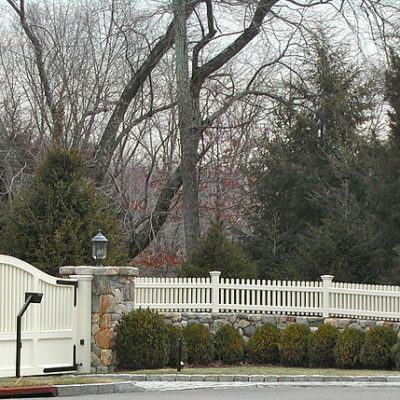 We believe that we are the only local fence company that has our own in-house design team. 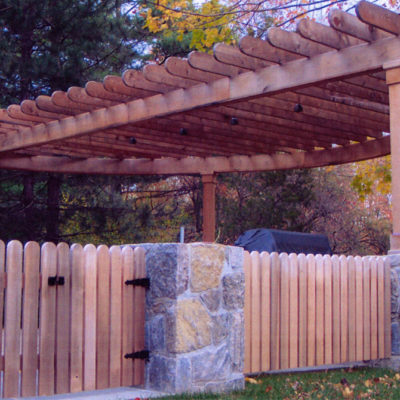 This gives us an edge to be able to create not just functional, but beautiful fence creations on your property. And we do this at no added cost to you, either. This is part of the Red Fox standard. We invite you to see what sets Red Fox Fence apart as the best fence company in town! 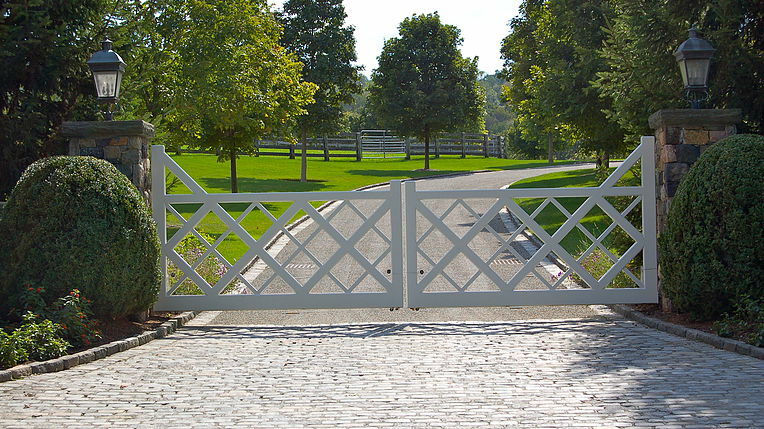 STANDARD & CUSTOM FENCING, ENTRY GATES, ARBORS, & MORE! 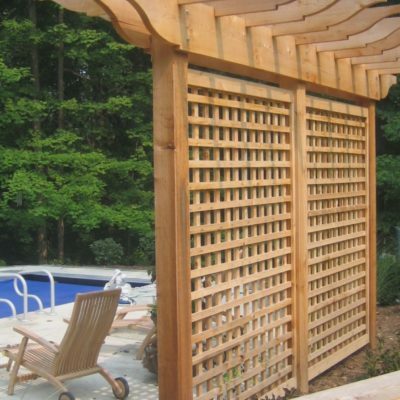 Custom Western Red Cedar Pool Fence. 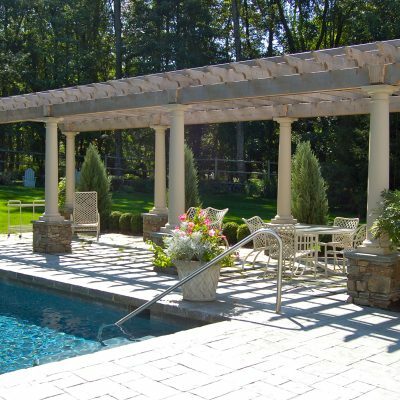 Designed and Built by Red Fox Fence in compliance with pool code regulations. 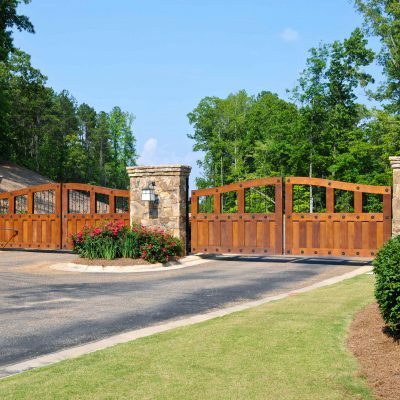 See the many styles of beautiful driveway entry gates from Red Fox Fence! 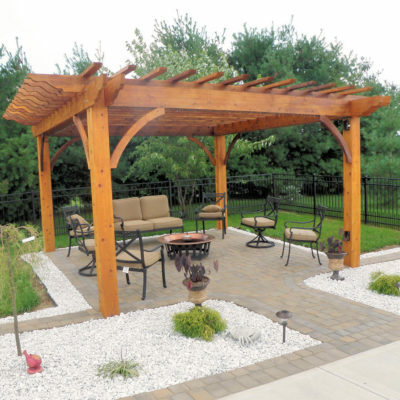 Cedar Pergola constructed by Red Fox Fence. Many sizes and styles available! 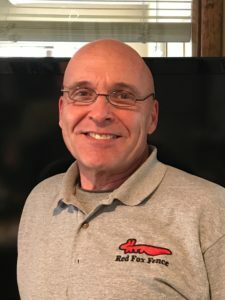 Red Fox Fence is a full-service company, established in 2006 and based in the Tri-State area of New York, Connecticut and New Jersey. 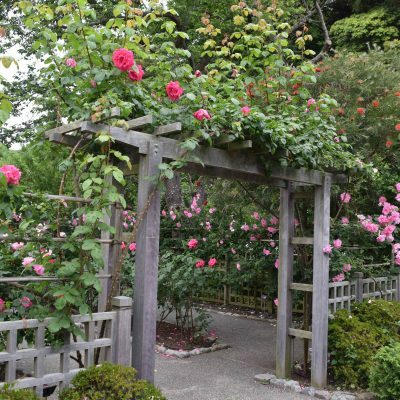 We specialize in many different types of fencing, entrance gates, decorative landscape structures, decks, new and enclosed gardens as well as railroad tie walkways and walls. 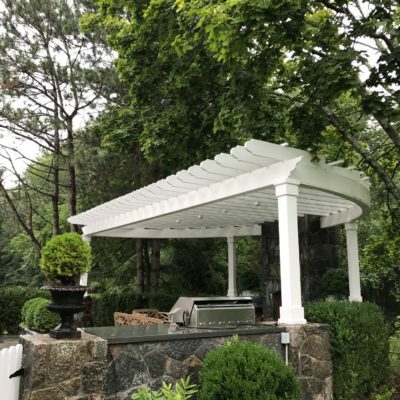 Designing beautiful fencing, entry gates, decks, and other landscape structures since 2006, Red Fox employs a design staff that can design these elements to be functional, & add to the aesthetics of your property. 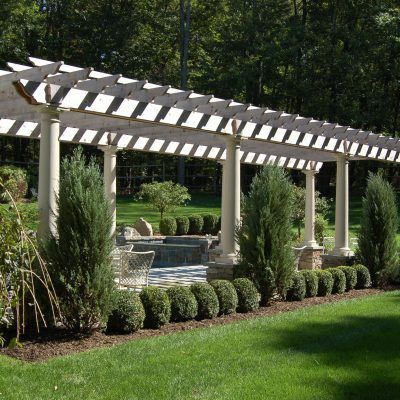 By paying attention to detail, we can really bring a design out that will compliment your entire landscape. 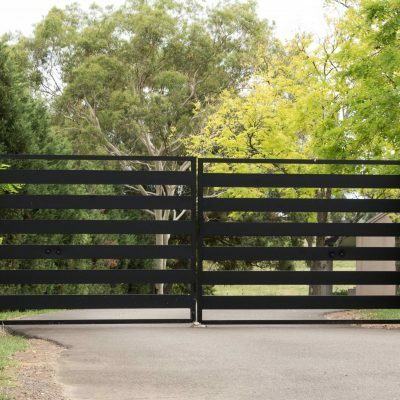 And much like a work of art, your property fencing entry gates are there to not only provide security to your home & property, but to also contribute to the overall visual appeal, as well. 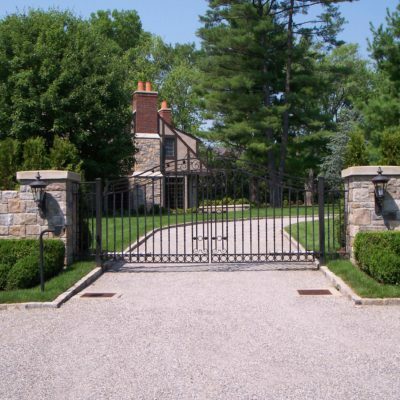 By choosing Red Fox Fence to design & install your next fence, driveway entry gate, or garden structures, you are employing a fence team with its own in-house design department. 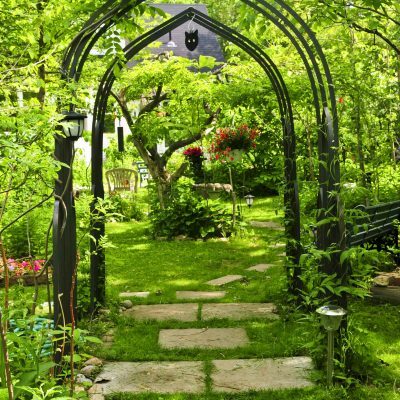 We have the ability to design a fence, entry gate, or garden structure collection that will not only be functional &beautiful, but will also be original! At Red Fox, we pride ourselves on constantly learning & improving every day. 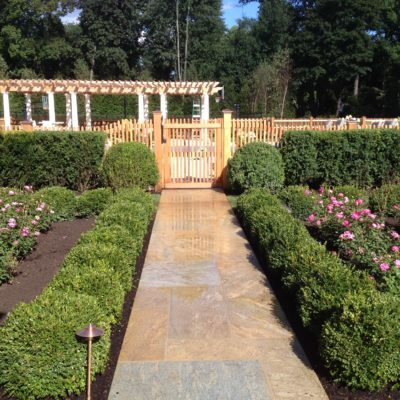 Whether it is a new style of fence, a new construction material, or a new design idea, we are able to utilize the latest methods, materials, and ideas when helping you design & create your fencing, gates, or other landscape structures. We look forward to demonstrating this to you when we meet! Our principals have been in business for many years, and have always maintained that there is only one way to complete a job, and that is the right way. 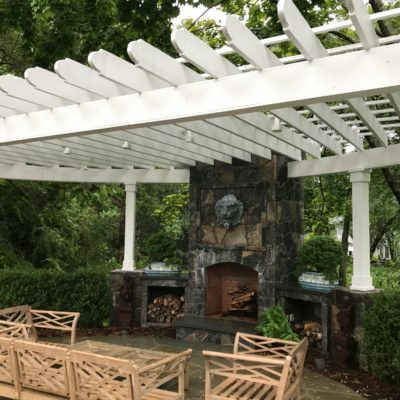 Insuring that every job will be build & installed correctly, without cutting corners, ensures that every customer is satisfied with the quality & workmanship of our services, and also in the fact that they received a very fair price. 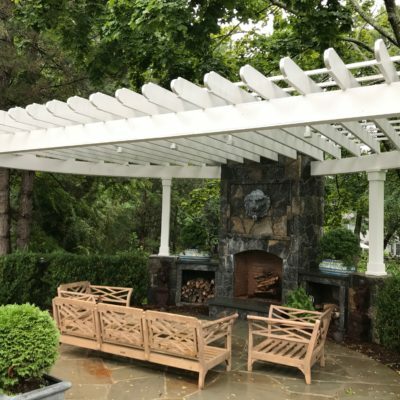 We have many long-term relationships throughout the Tri-State area with our long list of very happy clients, for whom we have done hundreds of fence, entry gate, and other landscape structure jobs since 2006.